Thank you to everyone who has donated towards cookery classes for people who use foodbanks. Carly and Nick both completed the half marathon in brilliant times – sadly Zoe succumbed to an injury and was unable to take part. In addition to the £162.50 online donations we have raised another £600 through our Pub Quiz Night and our Film Night. Again, a massive thanks to all of you! 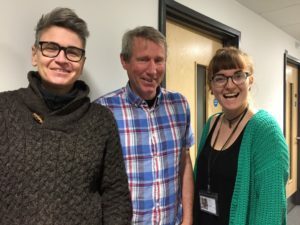 Carly, Nick and Zoe will be running the Brighton Half Marathon on 24 February 2019 – and they would love you to sponsor them! Please visit our Virgin Money Giving page to sign up. We are raising money for Cooking on a Budget workshops together with the Brighton and Hove Food Partnership in their wonderful new community kitchen. These workshops will be aimed at helping people who use one of the 17 foodbanks currently in existence across the city. Demand has risen sharply in recent years and we want to do more for people who have to use foodbanks.